More information about how a Infrared camera works in this link. Bridging the gap between single spot infrared thermometers and infrared temperature cameras, the Flir TG165 gives you the advantage of thermal imaging to help you discover temperature issues you can’t see with typical spot radiometers. You’ll work more quickly and have confidence you won’t miss anything vital. Equipped with FLIR’s exclusive micro thermal camera, the Flir TG165 helps you identify heat patterns, reliably measure temperature, and store images and data for reports. With a spot ratio of 24 to 1, you can take accurate readings from safer distances. The Flir TG165 is simple to operate, featuring intuitive menu icons and dual laser pointers. Built by the world leader in thermal technology, the durable Flir TG165 will quickly become your “go to” temperature measurement tool. 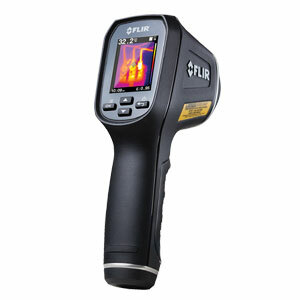 Flir TG165 Imaging IR thermometer with traceable calibration certificate. Nota: Comes complete with 3.7V, 2600 mAh rechargeable via micro USB lithium-ion battery, lanyard, USB cable, international charger (US, UK, EU, AU, CN), 8 GB micro SD card and operator’s manual.